"Labour cannot handle it alone"
It was a most cruel hand dealt by Mother Nature, leaving the country in a wretched and impotent state. However, the bitterness and brutality of Hurricane Maria has given a second chance to make a great statement on climate resilience in keeping with prime minister, Roosevelt Skerrit's vow to the United Nations, according to former diplomat Crispin Gregoire. The first opportunity came, Gregoire told The Sun in a telephone interview from New York where he served for eight years as Dominica's ambassador to the UN, when Tropical Storm Erika left an entire community destroyed and a country on its knees in August 2015. "The government didn't do anything about it. They did not prepare people for a category one [hurricane], far less a category five." 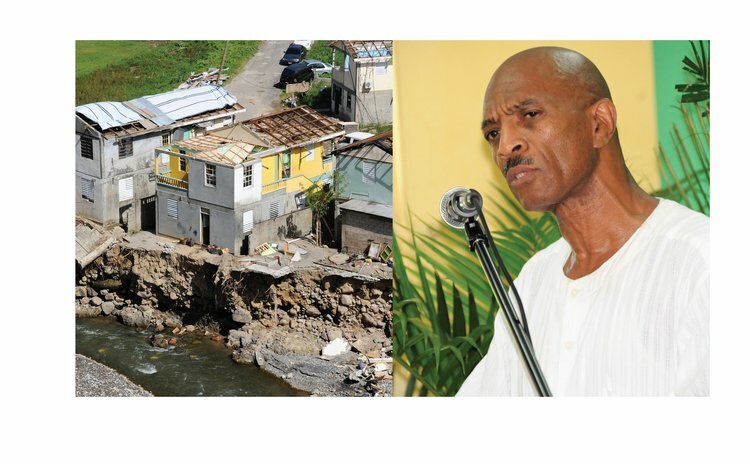 With Maria having caused an estimated US$931 in damage and US$380 in losses, and leaving the country needing some US$1.4 billion to recover, Gregoire endorses Skerrit's stated intention for Dominica to rise from the ruins of the nasty storm to become he "world's first climate-resistant nation in the climate change era". But in order to achieve this, he tells The Sun, the country must face a few ugly realities that it has not dealt with since the abolition of slavery - that of the vulnerabilities of several communities such as Colihaut, Coulibistrie and Pichelin that sprung up on the borders of slave plantations. "Most of the communities that were affected were communities that were built after slavery on the periphery of slave plantations. These places that were not habitable places [during slavery] have become places that are not habitable anymore. In a climate resilient environment these villages are no longer viable," he said. This means including relocation costs in the plans for rebuilding, which will be overseen by a Climate Resilient Execution Agency for Dominica (CREAD), to be managed by an experienced business oriented chief executive, Skerrit told a recent UN donors meeting in New York, but which must involve all hands, including the opposition, Gregoire recommends. From energy to housing, the international development expert looks at key areas that must be addressed if the prime minister is to achieve what is a long-term goal. He calls for the construction of mini electric grids to serve various communities, limiting the risk to one district should there be a problem in another, with emphasis on wind, solar and water. "All of that will be powered by cheap energy . . . I'd decentralize the grid and use the new technology of solar and wind, and we could still hold onto hydro but get rid once and for all of diesel." There must also be stricter building codes with an emphasis on concrete houses, since Hurricane Maria has demonstrated that wooden homes are no longer viable, neither were the homes build as part of the much touted housing revolution, Gregoire says. "It's [also] an opportunity to rebuild Roseau because Roseau had substandard housing." Of course, a climate resilient country must have a strong agriculture base with crops that can withstand hurricanes, which are part of Dominica's realities, Gregoire explains. Therefore, he says, there must be a push towards root and tuber crops, particularly cassava and turmeric. "The only crops we have left are those that are underground – I call this hurricane resistant crops – so we are going to do agriculture that is resilient to hurricane realities. So in addition to the yams and dasheens we need to plant more cassava and turmeric." The former diplomat also promotes a massive tree planting programme to rebuild the forests, a more robust telecommunication system, including underground cables and cell towers that can withstand category five hurricanes, a strong emphasis on roads and bridges, and strengthening the primary health care system, which he says had been neglected over the years. This will be costly, Gregoire admits, but necessary if the prime minister is serious about his pledge. "It's an opportunity to rebuild the place completely. If we're talking about building a climate resistant country those sectors [must be strengthened]. To build back, it's going to be many, many generations. I am just disgusted that Skerrit is not taking a bipartisan approach. The Labour Party cannot handle it alone."